If dogs could speak, what would they say? This rhyming story is told in first person’s point of view by a dog. 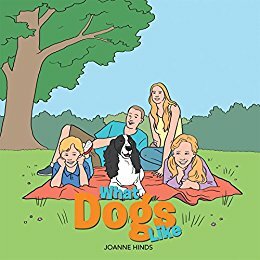 young readers into his world and teaches them how to interact with dogs. effort done here. I think there is room for more books in this series, like advanced communication techniques for situations not covered in this book, for example, when meeting other dogs in the dog park, or when you have company. However, I feel that the storytelling method used in the book somewhat diminishes the message. much better with some “showing” instead of “telling”. The illustrations are pretty basic stock imagery and I think that using lively images or even photographs would have created a bigger emotional connection. With that being said, I believe that the text can provide a discussion starting point about the family dog, and in my opinion, that’s a good enough reason to get this book.